Although you may equate engine wear and deposits with sudden, catastrophic engine failure, they are more likely to erode engine power and efficiency over time. Here’s how it works and what you can do about it. Several factors cause an engine to slowly lose power, but one of the primary reasons includes compression loss due to wear and deposits. For your engine to produce maximum power, the combustion chamber must seal completely during the compression and combustion strokes. Wear and deposits can prevent the valves or piston rings from sealing, allowing pressurized gases to escape the combustion chamber and take potential engine power with them. To illustrate, imagine using a hydraulic floor jack. Pumping the handle will raise the vehicle as long as the release valve is tightly seated and doesn’t leak. A poorly sealed release valve, however, allows pressure to escape, causing the vehicle to sink to the ground no matter how much you pump the jack handle. The same principle applies inside your engine. 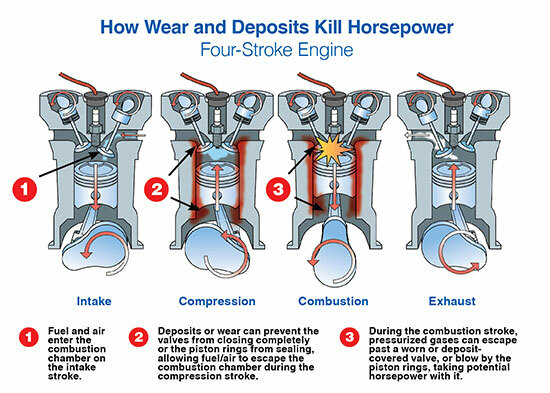 If some of the pressure created during the compression and combustion strokes is lost due to valves and piston rings that don’t seal completely, the engine will create less power. Over time, deposits or valve wear can prevent the valves from closing completely, interfering with a good seal. Wear can also interfere with proper valve operation, disrupting optimum fuel/air flow. Worn or stuck piston rings produce the same effect. The rings are designed to move freely in their grooves and press tightly against the cylinder wall, forming a seal that prevents fuel/air from escaping. Ring wear can interfere with formation of a tight seal, while deposit buildup can cause the rings to stick in their grooves, also preventing a good seal. As a result, some fuel/air escapes the combustion chamber during compression, reducing power. On the combustion stroke, pressurized gases can blow by the rings and travel down the cylinder wall and into the oil sump, taking potential power with them. This is what’s meant when someone says an engine has lost compression. A lot is working against you including the quality of the gasoline available here in Sioux Falls. Everything you can do to prevent deposits goes a long way saving you money in the long term no t to mention engine life. AMSOIL Signature Series Synthetic Motor Oil provides 75 percent more engine protection against horsepower loss and wear than required by a leading industry standard*, extending the life of vital components like pistons and cams. In addition, it prevents piston deposits 93 percent better than required to meet the latest API standard. * Its outstanding performance helps prevent deposits and wear that rob engines of horsepower, helping preserve that like-new feeling you crave when driving. The secrete is in the low volatility of the oil. That can only happen when quality is the main driver of the firm. Your Sioux Falls Power Gain by Oil company. 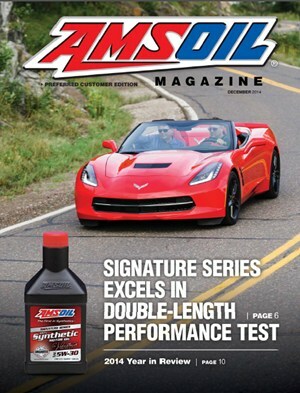 Most AMSOIL customers discovered AMSOIL via word of mouth due to performance only!! Not because our products save fuel or last 3X longer. It’s the real benefit of performance you can feel!! So compare that to other brands and more research will unveil the BIG lie they “don’t” offer to the consumer as advertised. AMSOIL is a family owned and operated business. No greedy stockholders to effect the choosing of additive packages.